I am putting in a gassification boiler with storage to supply infloor hydronic heat. I plan to include a mod/con aux boiler for backup and when away. I found this figure in Caleffi 17 and am wondering why the aux boiler return isn't plumbed to the bottom (cold) part of the storage tank. I thought mod/con boilers liked a cold return??? The text says that it is plumbed this way so it only heats the top of the tank but that should be taken care of by the sensor placement...What don't I understand??? That’s a good question for @hot_rod. I’m sure it’s in the text. But just looking at it, look at the sensor placement. It appears to me that if you need the aux boiler, you want to send its output directly to the emitters, not charge/mix the buffer tank. Do you see the description on Sensor (S3): OFF when S3 > 130F? Condensing happens best when return water temps are below 130F. That means the mod/con is not operating ABOVE this temp. Amigright? @STEVEusaPA, the reason it is being piped into the storage tank is so that the top can be used as a de facto buffer tank for the mod con boiler to prevent short cycling. Yes, I see that the mod con will see return temps up to 130F due to sensor S3 and yes, @psb75, you are right that limiting return temps to less than 130F will permit the mod con to condense, but I was under the impression that mod con boilers were more efficient at lower return temps (see chart below), and thus wondering why you wouldn't take the cold water from the bottom of the tank, where it may be at a relatively constant 80F due to the low temperature return from the infloor radiant and good temp stratification??? I have noted on the graph the loss in efficiency in using a 130F return versus a 80F return. Again, what am I missing??? 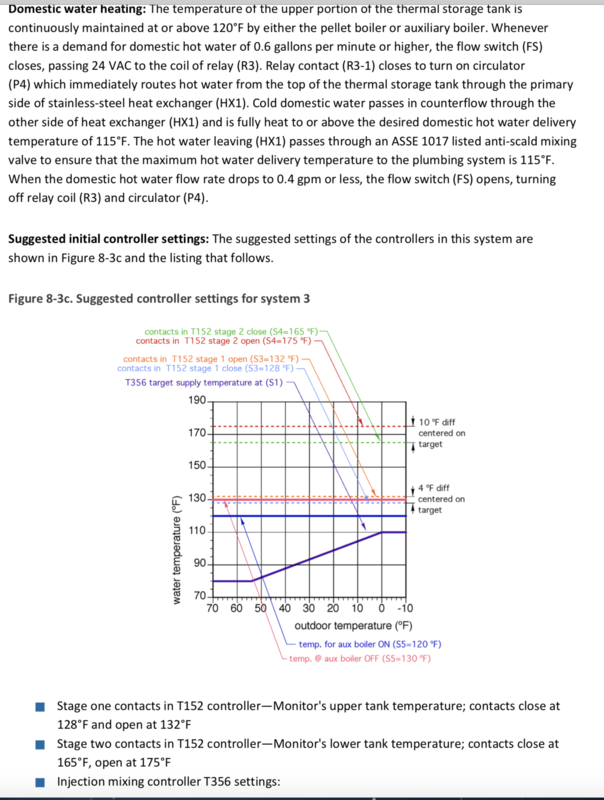 @hot_rod really needs to answer your question, this being a Caleffi schematic. You have a correct understanding of condensing temperatures. What is problematic is that you have a mod/con boiler that "likes" to condense and you also have a bio-mass (pellet) fueled boiler that doesn't "like" to condense. I think it would be good to uncouple the mod/con from the buffer tank. I don't understand the nature of your pellet boiler. Don't you have a bulk (auto-feed) pellet supply so that the pellet boiler can heat even when you are away so that you wouldn't need a fossil fuel boiler? 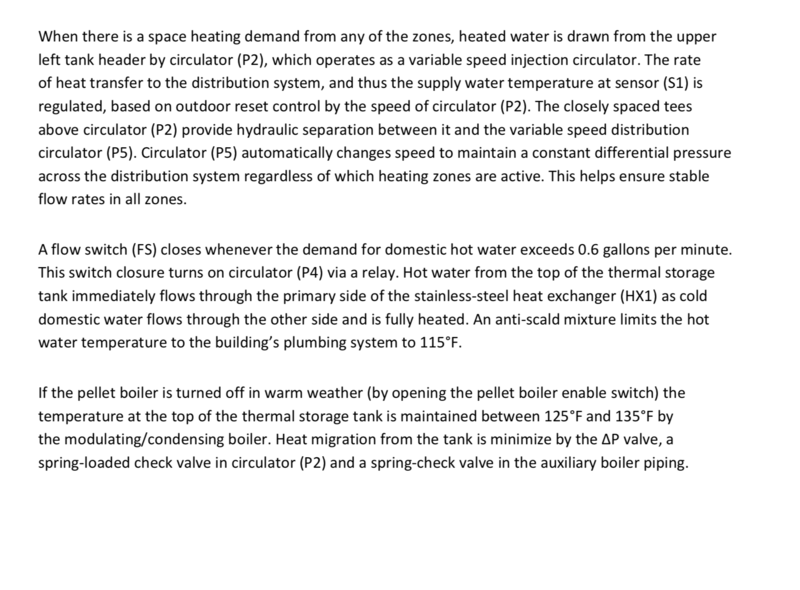 @psb75: the type of heat source connected to the storage tank really shouldn't matter in regards to my question. Point of fact, I will have a wood gassification boiler plumbed to the storage tanks, as I mentioned in the first line of my original post above...The mod con would only run when the wood boiler is off line. It's just for back up or possibly for heating a hot tub. It is decoupled in any case from the wood boiler through the storage tanks. It’s not being used as a buffer or to charge the buffer per se, but to help the pellet stove when it can’t keep up. Imagine a zone is calling. Trace the path from the buffer to the zones and back to the buffer. The aux boiler only wants to heat the top of the tank. The zone draws out the top of the tank. If the boiler is satisfying the zone load it will charge the tank until it gets up to 130. If not it will run and send that water to the zone, working off the top of the tank. With a buffer tank you want stacking. Running the return into the bottom from the aux boiler will do the opposite. 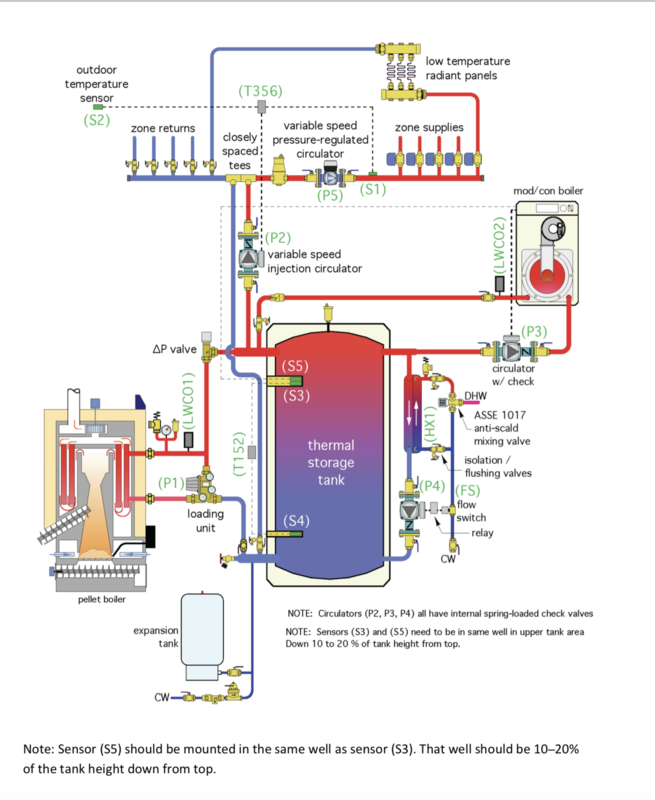 ...it is also possible to combine the temperature-stacking control logic used with pellet or wood chip boilers with operating logic that allows an auxiliary boiler to be turned on when the biomass boiler cannot keep up with the heating load. 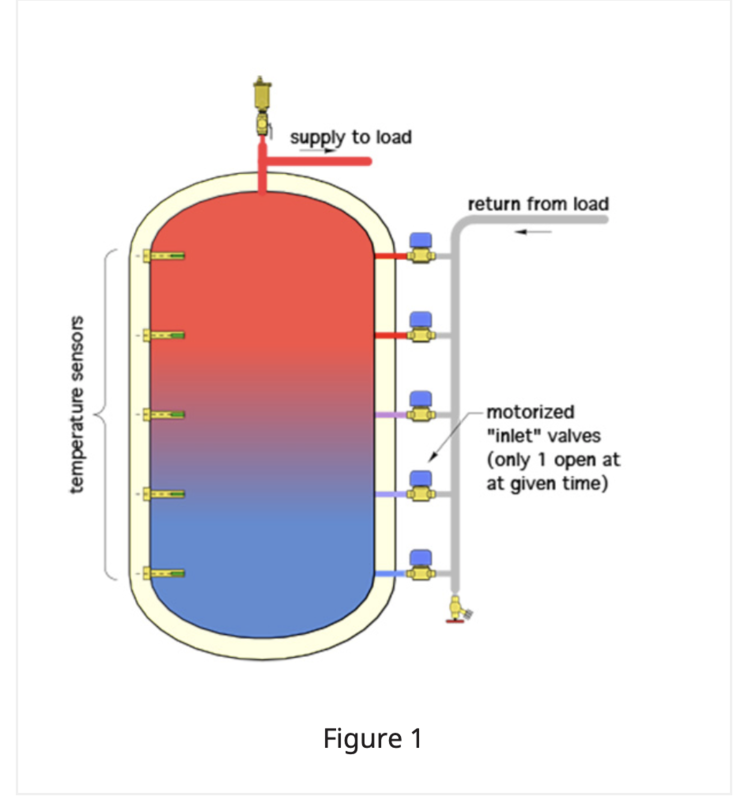 The method shown assumes that the auxiliary boiler is piped into the upper portion of the thermal storage tank, and thus only interacts with a small portion of the tank’s thermal mass. This minimal interaction helps prevent the auxiliary boiler from short cycling when it supplies a highly zoned distribution system. At the same time, it prevents the auxiliary boiler from heating the majority of the water in the thermal storage tank. 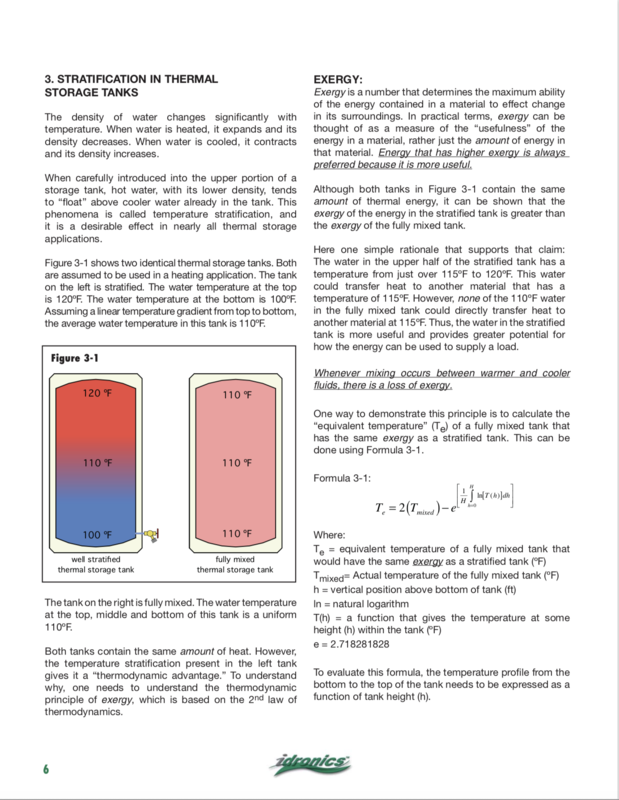 "The method shown assumes that the auxiliary boiler is piped into the upper portion of the thermal storage tank, and thus only interacts with a small portion of the tank’s thermal mass. This minimal interaction helps prevent the auxiliary boiler from short cycling when it supplies a highly zoned distribution system. At the same time, it prevents the auxiliary boiler from heating the majority of the water in the thermal storage tank." Is what a buffer tank is designed to do. Utilizing the top of the storage tank in effect creates a "buffer tank" for the aux boiler so it doesn't short cycle. 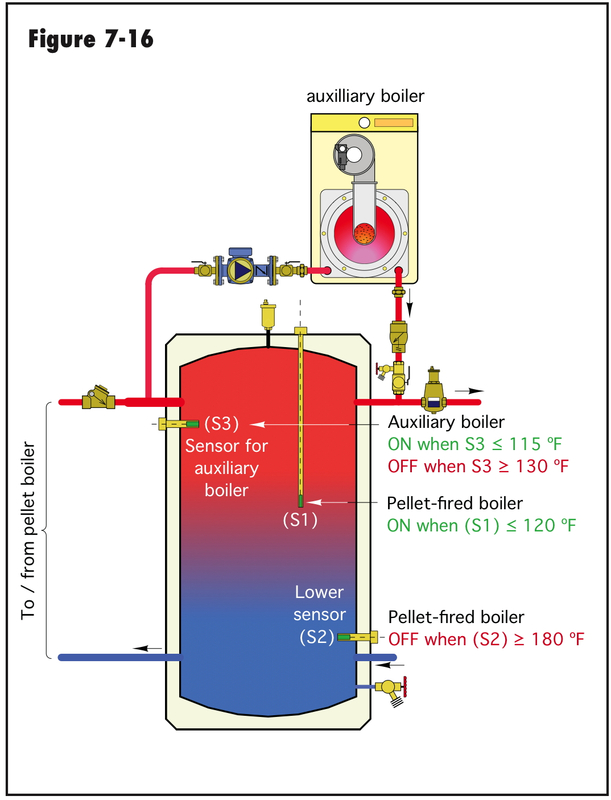 The amount of water the aux boiler heats in the storage tanks depends solely on where the sensor S3 is located. The closer to the top of the tank, the less water in the storage tank is heated, regardless of where the return to the boiler is located. Correct, we want the pellet or bio, or solar to handle the load as much as possible and use as much buffer as possible. The mod con only "backs up" the primary heat source. 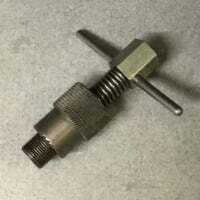 You could calculate the ideal buffer for the mod con based on turn down and smallest load, and make its return connection, or a dip tube to the exact spot in the tank. @hot_rod: can you please explain why the return to the mod con is from the hot water at the top of storage rather than from the bottom where the water would be (?) colder, providing better thermal efficiency for the mod con? 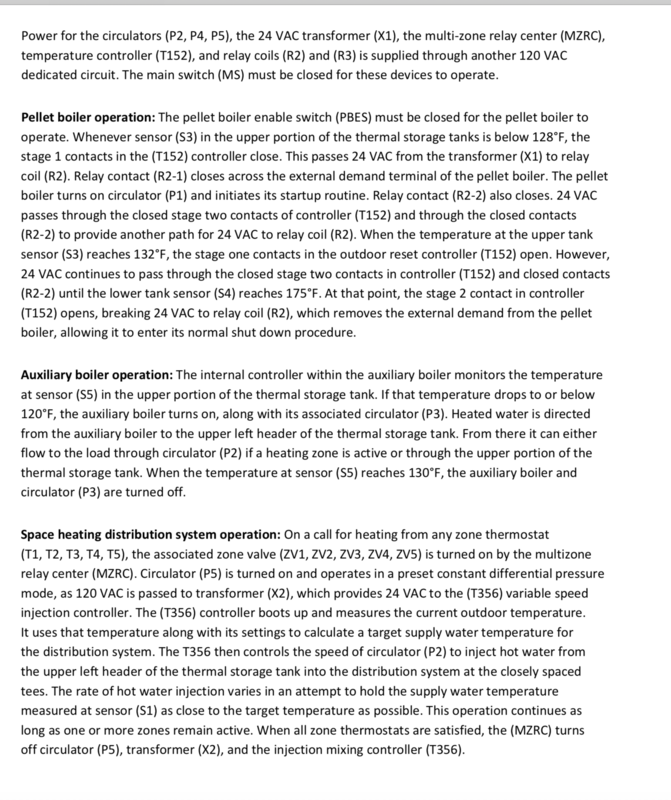 I understand you only want to use part of the storage tank for the mod con buffer, but isn't that buffer volume determined by the location of the sensor that turns the mod con boiler off, rather than on where the return water is piped from? It is basically a trade off depending which function is more useful for your design. If the buffer is intended mainly to store energy from the wood or biomass source, then you want the mod con to contribute the least amount, a cold return also increases the efficiency of the wood or bio fuel, with adequate return protection of course. Think of the mod con as a tankless heater only needed to cover loads when the primary source is unable. If the system is single or large zones and the mod con modulates down low enough then really it doesn't need or want any buffer. Your system may have some micro loads that could cause short cycling, so a bit of buffer may be an advantage. Also if you are going to use the upper buffer for DHW production with a heat exchanger, then of course one of the boilers always needs to maintain that upper tank at a high enough temperature. I've found on my own system I have maybe 25 gallons of the top for the mod con buffer, and with a large 40 plate HX I can generate DHW with the tank as low as 120F. Now every system will be unique in it's needs and design, calculate out what you expect for run cycles, etc and adjust that tank capacity as required. You can use a dip tube cut to a certain length to get the tank return port exactly where you need it, no need to weld in special port locations. Another key design is how low of a temperature you can get useable heat from the tank. If you system can run down to SWT of say 120F, then that upper tank would be able to run down that low before the back up kicked on, so returns would still be in a good range for condensing. The ODR is also an important control detail, as it "allows" that tank to be used down to the lowest possible temperature, before the second boiler needs to fire. The distribution in ANY system drives the operating conditions of the boiler (s) and of course the tank. Always design the system to operate at the lowest possible SWT, both for efficiency and to maximize the tanks buffer-ability. If you could charge that tank to 180F or higher and draw down to 120, you have a huge ∆T to work with. "You can use a dip tube cut to a certain length to get the tank return port exactly where you need it, no need to weld in special port locations." 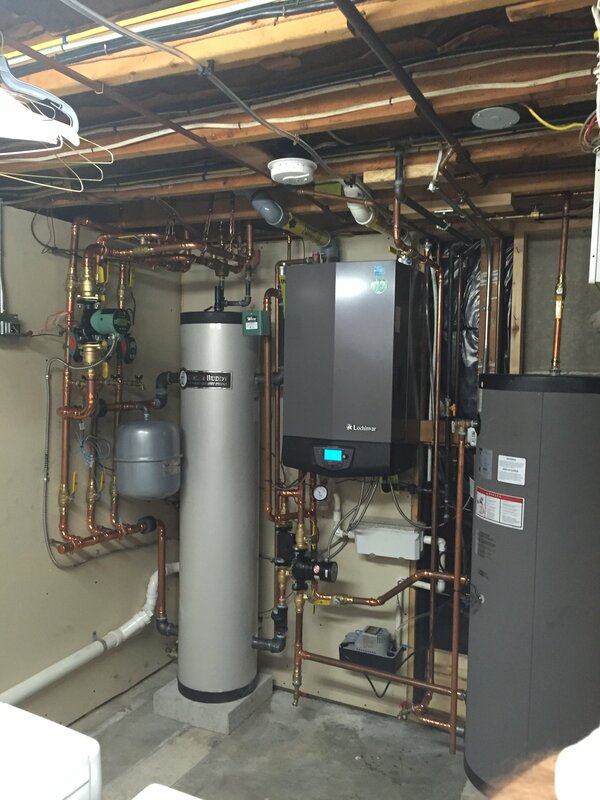 Both the original Ihydronics 17 figure I originally posted above, as well as the system plumbing schematic you posted, show the mod con boiler being fed from the hot end of the storage tank. Given the above assumptions, why would we ever want to plumb the return to the mod con from anywhere other than the bottom of the storage tank, i.e., the coldest point in the system? Stated another way, when would we ever want to feed the mod con boiler less than the coldest water available? Granted the coldest return to the mod con would provide the best condensing. but we also need to pay attention to the conditions inside the tank. As soon as you start flowing any gpm from bottom to top you will break up any stratification in the tank, unless the exact gpm from the mod con flows to the system with a two three piped buffer. 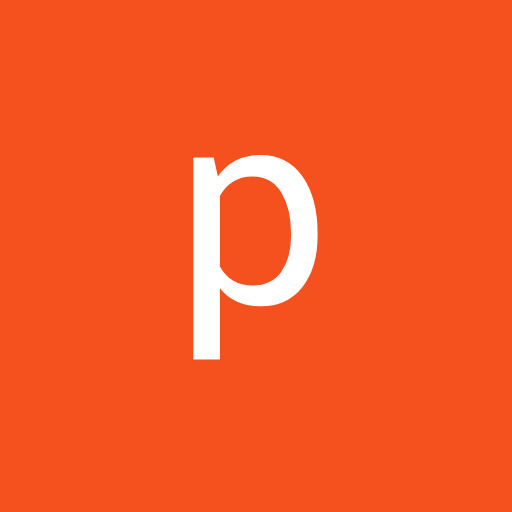 With a zoned system that condition may not happen or be only at design. Ideally we would rather not involve the buffer if loads match exactly. 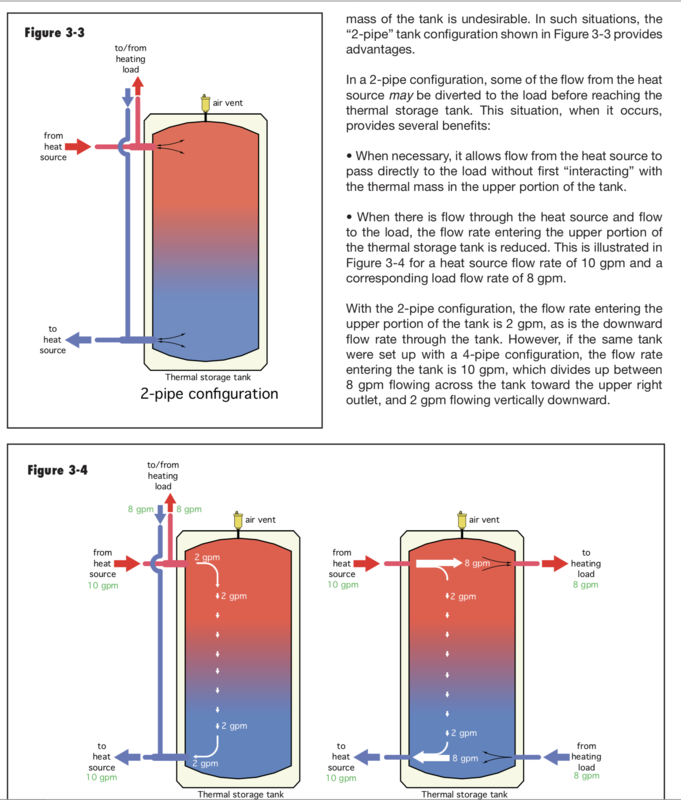 To get return to the boiler, it needs to pull flow down from the top supply, so right away you start blending up the tank temperature as well as breaking up the thermocline, depending on that top to bottom flow rate determined ho much or how quickly the tank becomes mixed. So the intent is the mod con "stirs" the tank the least by piping just near the top, and allows the primary boiler to cover the tank load better. It will best preserve the stratification if you just "move" the upper portion of the tank. Idronics 17 give you more of an explanation and some formulas to predict that energy. It comes down how to best cover all the intentions of the buffer tank, there will be some compromises. Ok, so you are saying that flow in and out of the tank by the aux boiler will quickly destroy any stratification, if I understand you correctly, so you only pull and return from the top of the tank to limit this mixing. Is this also the case then when the main boiler is running? 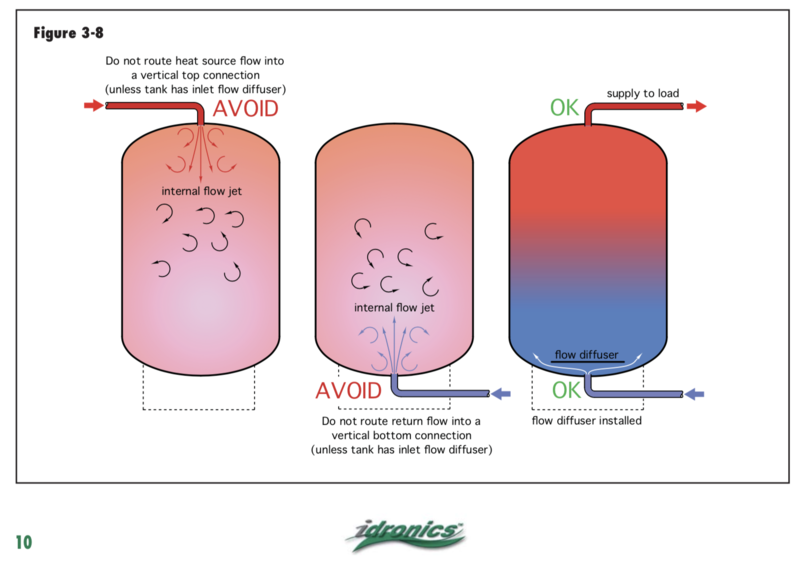 I have thought that when the main boiler is running, if the storage tank is plumbed with the two pipe method, the hot supply would enter and stay at the top while the cold water at the bottom of the tank would simply be returned to the boiler without much mixing, provided the tank is plumbed properly to avoid encouraging mixing and the inlet and outlet flow velocities were kept low through generously sized ports/headers. Is this a false assumption? If it is, then wouldn't running the main boiler also destroy the stratification and mess with the temperatures the tank sensors see to control both boilers? Again, thanks for your time- it's much appreciated. with two pipe plumbing IF the gpm from the boiler exactly matches the gpm going to the system, there is no movement in the tank. The large piping at the tank connection becomes a hydraulic separator allowing multiple, different flow rates to move with pump conflicts. Three pipe discussed in this article take it to a yet a different level and result. The amount you break up the stratification in the tank would depend somewhat on the flow rate. If 1 gpm goes thru the tank it would probably just slip down one side slowly and not blend the tank completely. If 10 gpm is going thru, probably it will quickly mix the tank, breaking stratification up completely. Also use diffusers to prevent tank mixing at high flow rates. Or as Mick put it, "you can't always get want you want, but if you try sometimes you might find you get what you need"
Sure, with 2 pipe plumbing, when the load calls, part or all of the main boiler supply will go to the loads, the difference, if any to the storage tank. That's the point of 2 pipe versus 4 pipe as I understand it as it will reduce the flow into the storage tank when the load is being served and should therefore reduce mixing/preserve stratification. Got that. If one is serving solely high mass loads which are supplied with relatively low temps and returning low temps, then clearly these would best be plumbed into the bottom of the tank. 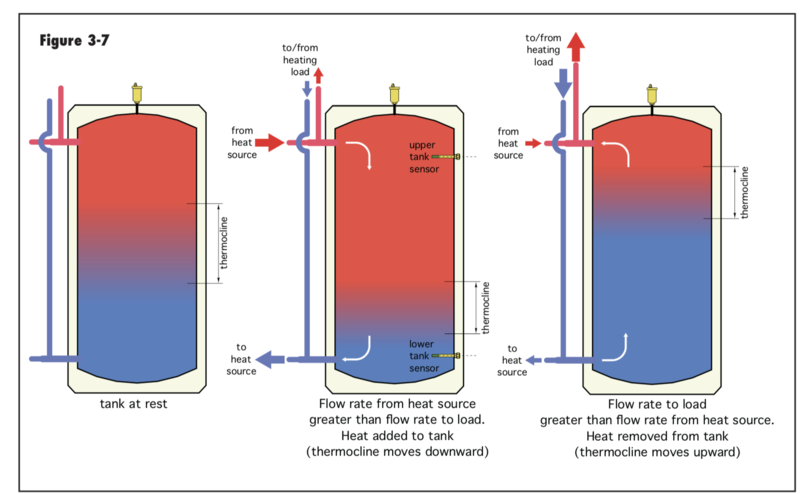 My assumptions for good tank stratification during main boiler charging of storage are based on following best practices for plumbing and filling- large headers, low flow velocites, diffusers, etc. Feedback I have gotten from several individuals running wood gassification boilers into large volume, highly instrumented storage has indicated that indeed, good stratification is observed while charging storage when these practices are followed. 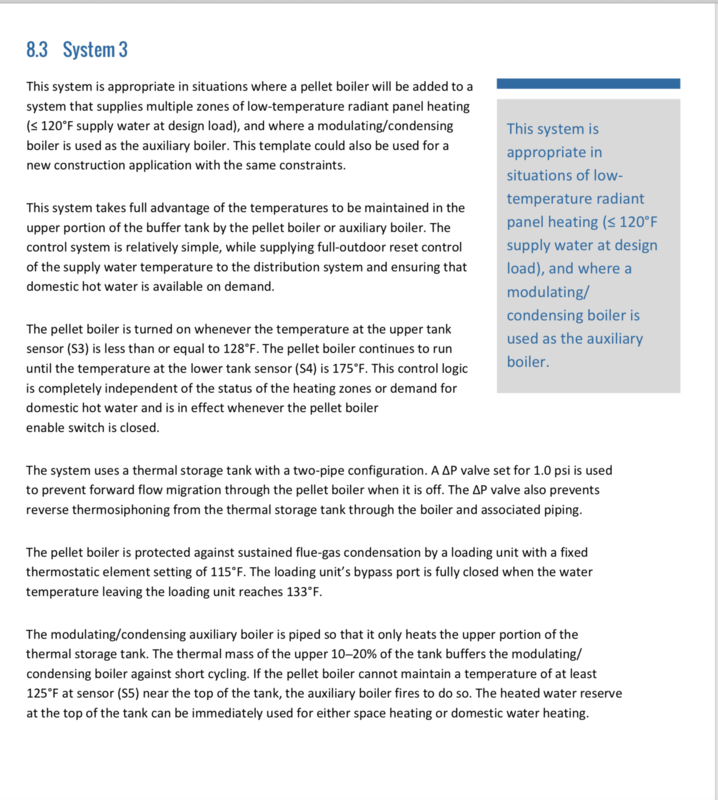 I would be inclined to think, based on their experience, that with high mass loads and an aux mod con boiler, feeding it from the bottom of storage rather than the top to take advantage of the increased thermal efficiency, may not in fact be at the expense of destroying the thermal stratification in the storage tanks. Perhaps this would be a good area for experimentation to see exactly what might happen. I will continue to study the issue and perhaps when I install this system this spring will see for myself and report back. I much appreciate the explanation as to why the aux boiler is plumbed to the top of the tank. 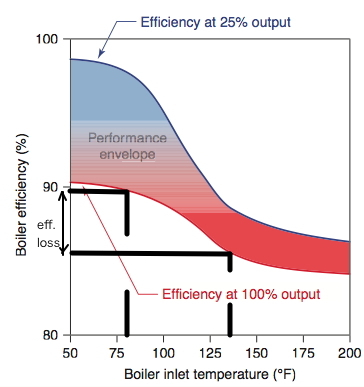 What happens when both boilers are running and the input from the main boiler is arriving at 160F or 180F? It would seem it would be piped into the input of the aux boiler, no? One potential issue is the delta T the mod con is capable of delivering to the load. On my mod con, I never see more than a 10 F delta between boiler input temp and output temp, and that is only when heating the indirect at full fire, on low fire typical for heating I might see 4 or 5 F.
If you need 120 F supply to your emitters, supplying your mod con with 80 F water probably won't get you there in only one pass through the boiler. Most mod cons I have looked at are fine with a 20-40 delta T. The IBC boilers I have been looking at, for example, are speced with a max delta T of 40F. Sounds like you might have too much pump....??? I'd like to try the new Lochinvar or others others, where the pump speed modulates, that might be a way to better control output when the mod con goes directly to load without additional mixing? The control logic is critical getting a handle on how well this system works. ∆T controllers watch multiple temperatures and decide when to make the switch. I think if you look closely at the temperature settings, the mod con only gets involved when the primary boiler is off? I don't see where you would be good to run both boilers at the same time knowing they pull from different levels in the tank. For me the mod con runs when you don't want to run the RE or maybe summer mode when you tire of building fires Which is another reason not to heat the entire buffer just to cover DHW in summer. Really the control logic needs to be customized to the specific application. I always suggest you start with thinking and planning the control sequence before you start buying components and piping, as it is not always possible to get the piping and controls on the same page. 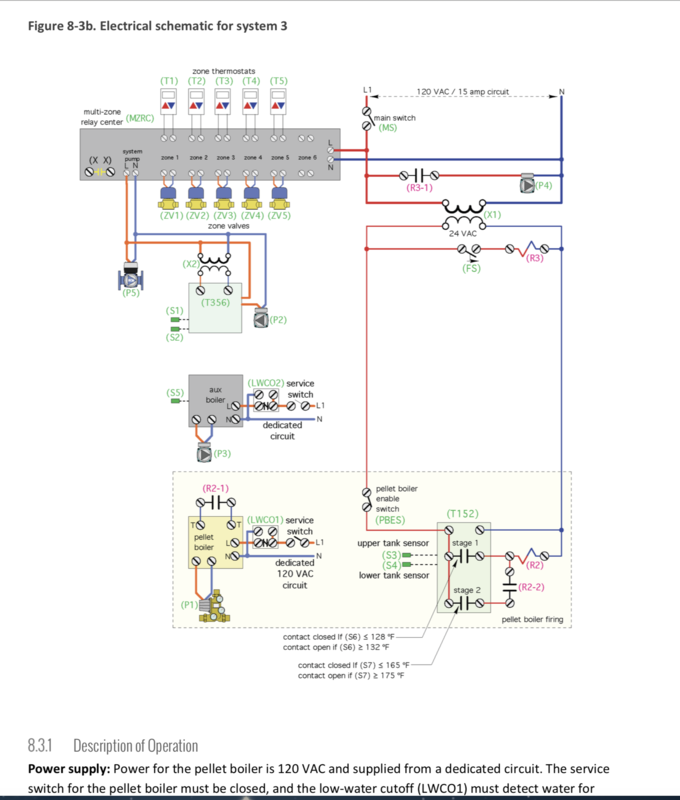 Keeping in mind the control package to drive the whole thing should not cost more than the mechanical components So I look for inexpensive off the shelf differential controllers, etc, so it is serviceable and easy to troubleshoot years down the road. Thanks for the tip on controllers.